Crooked Lane Books, 9781683311263, 320pp. When People's Republic Flight 91 crashes in northeastern Ukraine with a U.S. diplomatic agent onboard, U.S. Diplomatic Security Service Agent Raisa Jordan is sent to investigate. The agent was escorting a prisoner home from Guangzhou, China, along with sensitive documents, and it quickly becomes apparent that the plane was intentionally downed. Was it to silence the two Americans onboard? As international relations and even more lives hang in the balance, Jordan races to stop a new Cold War. 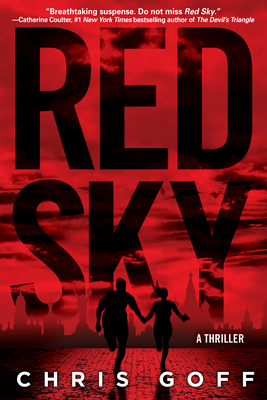 Red Sky, Chris Goff's pulse-pounding follow-up to Dark Waters, is yet another white-knuckle joyride for fans of Gayle Lynds. Chris Goff, an award-winning mystery author, began her career as a newspaper columnist. She has taught writing workshops and served on the board of Mystery Writers of America. Her debut thriller, Dark Waters, is a nominee for the 2016 Anthony Award for Best Crime Fiction Audiobook, and was a finalist for both the 2016 Colorado Book Award and 2016 Colorado Authors' League Award. She lives in Colorado.